Massive avalanche had hit the Jawahar Tunnel on the Srinagar-Jammu highway on Tuesday morning, leading to shutdown of the arterial National Highway. Rescue operations are underway, and no casualties have been reported so far. 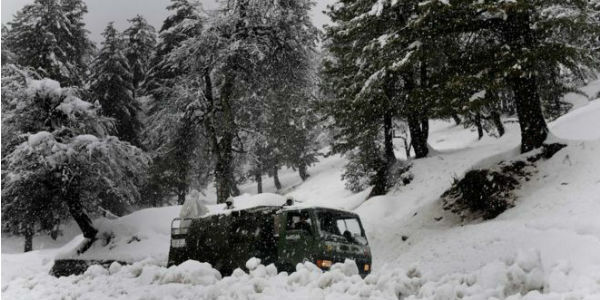 According to Skymet Weather, incessant rain and snowfall activities over the hills of North India during the last few days have triggered avalanche as well as landslides in few areas of Kashmir. Qazigund district is the latest region to witness these untoward incidents. Reportedly, as per the Traffic department officials, landslides have hit the highway at some places in the Ramban district, including Digdol, Panthal, Magarkote and Khoni Nallah. Moreover, as per officials, no vehicular movement will be allowed on the highway today. Landslide clearance will be started only after the weather starts improving. According to reports, fresh snowfall has occurred in the Banihal sector. Along with this, nonstop rains are continuing in other parts of the highway which hampering the rescue operations. Talking about the ongoing snow in Himachal Pradesh and Uttarakhand: Snowfall has covered high altitude areas including all the four shrines of Badrinath, Kedarnath, Gangotri and Yamunotri. Meanwhile, Pithoragarh and Mussoorie too received snowfall. There was heavy rainfall in plain districts including Dehradun since 3am.Vehicular traffic in Himachal Pradesh’s capital Shimla was also affected.